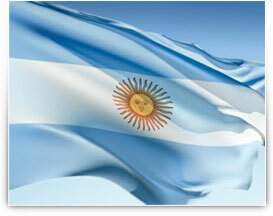 The Republic of ARGENTINA is the second largest country in South America and the eight largest in the World. ARGENTINA is truly a tourist’s Paradise! Hence it is often referred to as ‘The Land of Six continents’ due to its variety of landscapes, climate and people. The natural diversity from Jujuy in the Norte to the Tierra del Fuego in the south is simply amazing. Argentina is blessed with certain stunning natural wonders ranging from the boisterous IGUAZU waterfalls to the Perito Moreno Glacier, sub tropical forests, PATAGONIA – heaven on earth, and the most beautiful Lake District in the world – Barilloche! ARGENTINA is the cradle of TANGO and that adds to the intense romantic Nature of the Argentineans! ARGENTINA has attracted Italians, Spaniards, Dutch, English, Japanese, Syrians and Lebanese to make home here and that give it the title of being the ‘Melting Pot’ of Latin America. This adds further cultural diversity which is interesting to observe. Tourists often fall in Love with the character of Buenos Aires with all that it has to offer. Be it La Boca, Football, POLO, San Telmo square, Tigre, Fine Dining, Nightlife, Estancias and Gaucho parties – endless possibilities. Vibrant and Colourful beyond compare! ARGENTINA is about Romance, Dance, sumptuous Gastronomy, Natural beauty and above all - Living Passionately!